I very distinctly remember the first granola type cereal I ever consumed. It was CW Post cereal. Anyone remember that? It been ages since one could buy it, but when it first came on the market and my Mom brought it home, I probably ate the whole box by myself. It was kind of like granola, way sweeter though. And super crunchy. I recall that my teeth often hurt when I finished. When I was in college, I used to buy bulk granola from the natural foods Co-Op. I loved it as a snack and it transported well in my backpack, or my bike bag so I could always have something to nibble on. Of course, it was never an easy thing to try and sneak in the middle of a class since the enormous crunch of it always gave me away. For whatever reason, as an adult I never ate granola with milk, like a regular cereal. To me it was always snack food. I love it on soft serve ice cream, and especially in yogurt but I rarely eat it for breakfast. 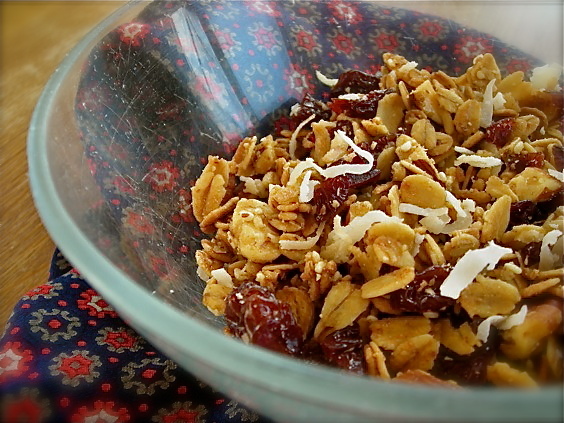 Granola is everywhere now, and the flavor combinations are endless. My local natural foods store has a decadent chocolate and coconut kind that I love and it’s almost impossible for me to go through there without pouring myself a nice bag to take home. I’ve made a lot of granola from scratch too and am always on the lookout for good recipes to try. Mike loves it too. With a container of yogurt and a bag of granola he has great snacking options. Griffin will even mix up a bowl on occasion, and believe me, I love to see that. Mike loves dried cherries on his yogurt, so a granola that included those was like finding a recipe that was created just for him. This particular one was from the LA Times, and touted as a nice holiday gift to give. Mmmmm, I thought it was just perfect as a token of appreciation for a hard-working spouse. Heat the oven to 275°. Line a cookie sheet with parchment and spread the coconut on it in a single layer. Toast in the oven for about 5-7 minutes, or until lightly browned. Timing will vary according to how fine the coconut is shredded. Keep your eye on it. Burnt coconut is NOT fun. Remove from the oven and place in a bowl to cool. Toast the granola, stirring every 15-20 minutes until the mixture is golden brown, about an hour. Remove tray and allow to cool slightly. Transfer to a large bowl and add cherries and coconut, stirring well to combine. 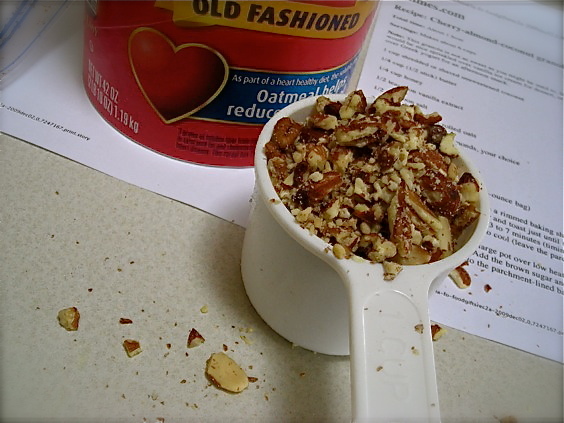 Be sure to use whole rolled oats for this recipe. The thickness will hold up better and overall, the taste and nutrition of whole rolled oats is superior. 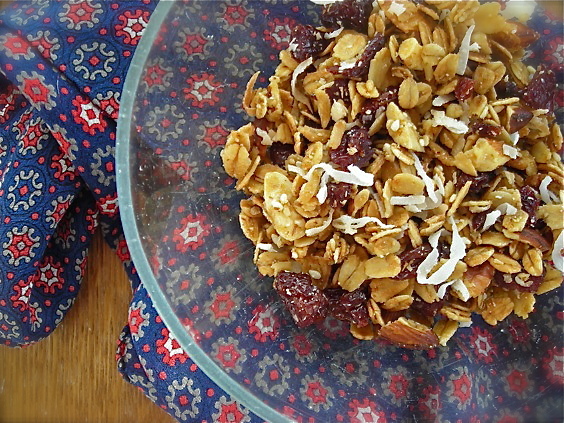 When I’ve made granola previously, I have used barley flakes and if you can find those, they make a nice addition to any scratch granola recipe. That looks great! I don’t know why I haven’t made granola yet. Our 4.5 year old is obsessed with it. And it is so expensive to buy it pre-made at the store. Homemade granola is amazing. I love your version! Yum! That looks seriously delicious. I love anything with dried cherries!